Conference organizers know the importance of providing equal access to audio-visual content to all attendees, whether local or remote. This includes any attendees with hearing and visual impairments. At the event venue, visually impaired attendees may experience difficulties viewing live presentation on the displays, stage or podium at the conference, located outside of their visual abilities or line of sight. The visually impaired will appreciate having the presentation streamed to their computer so he may use visual amplifications tools built into his computers or operating systems. Hearing impaired attendees may not be in a proper line of sight to see the sign language interpreter or close captioning, or she may simply want to amplify the sound levels by listening to an amplified audio stream on her computer or mobile device. Using VGADVI Recorder Pro, conference organizers and audio-visual professionals can stream accessible video presentations to both local and remote attendees with visual or hearing impairments services. Epiphan’s VGADVI Recorder Pro™ streams multiple views from multiple video source inputs. For example, the audio visual content from the presenter camera, the presenter’s laptop presentation, live views of the sign language interpreter, live views of the close captioning displays as well as audio content for the conference. An event can use VGADVI Recorder Pro to create various live video streaming output channels with various content sources and layouts. 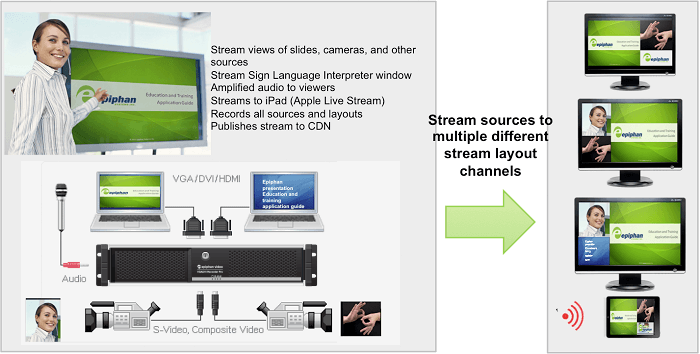 The visually impaired attendee can then choose the desired output channel view as a live stream to his laptop, mobile phone, iPad, iPhone, overflow room display, etc. The video streams can be transmitted to network router, then to the local WiFi, Ethernet and the Internet . The hearing impaired attendee can also select their choice of output channel showing sign language and/or close captioning, and/or use headsets on their laptops or mobile phone to amplify the sound audio levels. The conference organizer can also choose to create a simultaneous translation channel streams with different languages over-layed on the various channel outputs. Attendees then visit the URL of their choice to see and/or listen to the channel they prefer with their preferred mobile device, media player or internet browser. No additional software is required to be installed on the viewers computers or mobile devices. VGADVI Recorder Pro easily creates and streams video content from multiple audio-video sources to satisfy the special needs of all attendees either in person or remotely.